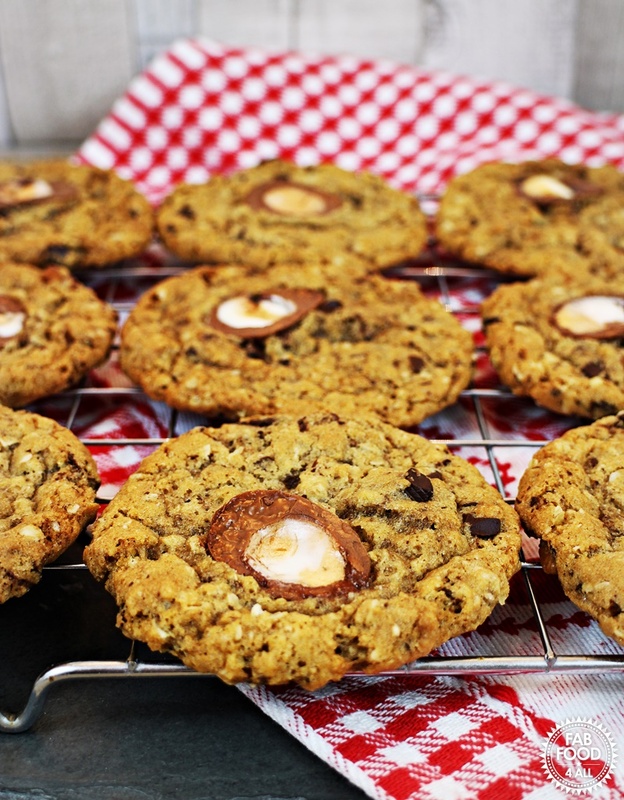 You are here: Home / Biscuits / Easy Creme Egg Cookies – deliciously crispy & chewy! 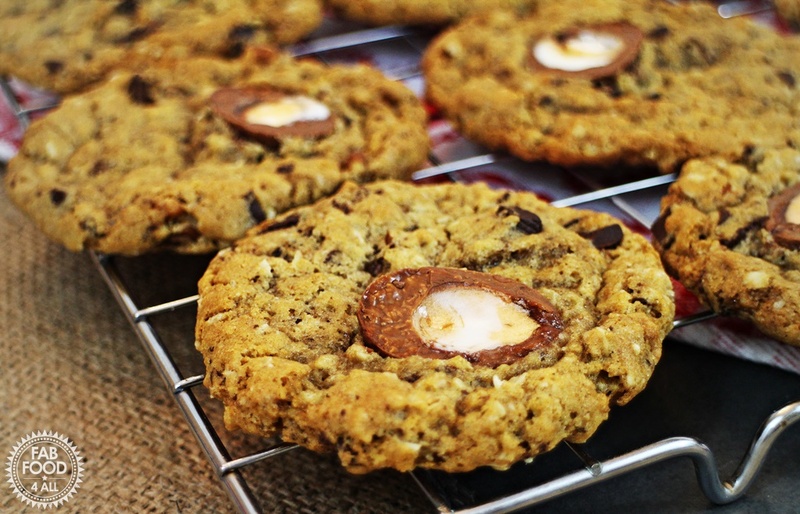 These Easy Creme Egg Cookies are just divine. 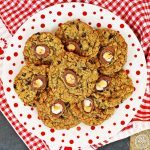 I love pecan nuts so decided to combine these with dark chocolate to complement the yummy Creme Egg on these crispy on the outside and gooey in the middle cookies. 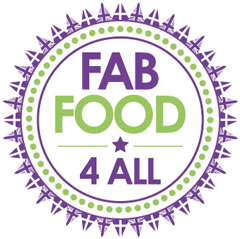 Can you believe I started out last week trying to cut down on sugar and banned myself from eating any chocolate in a bid to shift the Christmas weight gain! But the call of the Creme Eggs in the drawer was too strong and I was just itching to make something new with them this year as it’s become a bit of a tradition to create a sweet treat each Easter. As I’d already made Brownies and Fudge with Creme Eggs I decided it was the turn of the cookie to have a Creme Egg makeover. 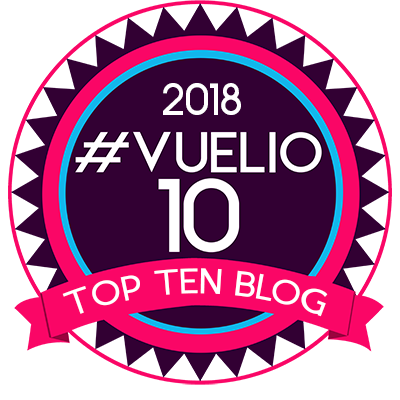 To say my family loved these is an understatement and I think they would rival the cookies in that famous cookie store that you find in most shopping centres. This recipe makes about 26 large cookies so is ideal for school bake sales or perhaps you are going to raise funds for Red Nose Day which is on 24th March this year. 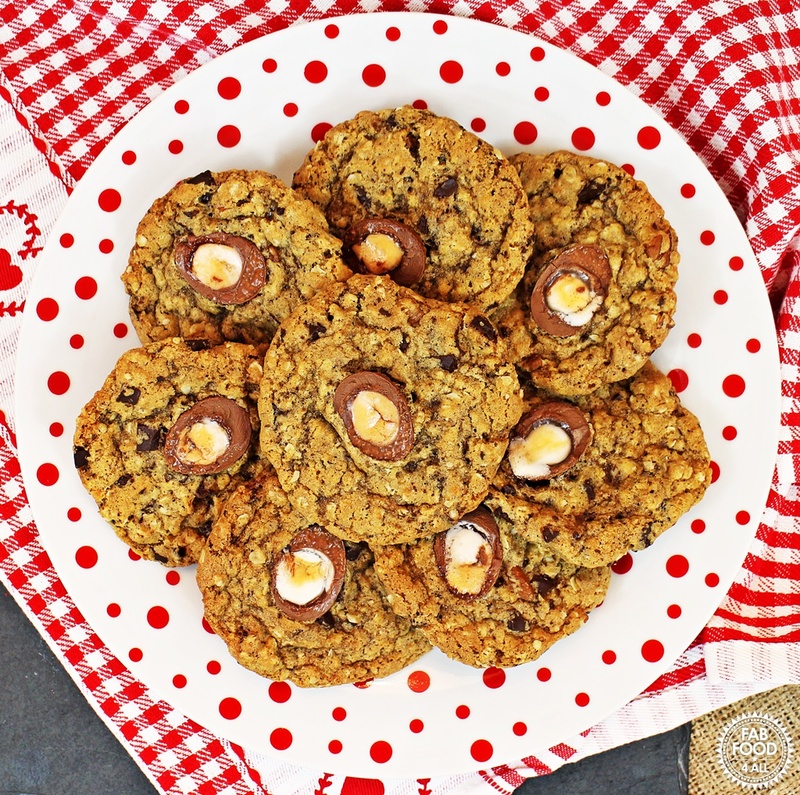 Easy Creme Egg Cookies are great for kids to make as they can help mixing, shaping the dough into balls and pushing the half Creme Eggs onto the top of each cookie. I’m entering my Easy Creme Egg Cookies into We Should Cocoa over at Tin & Thyme. 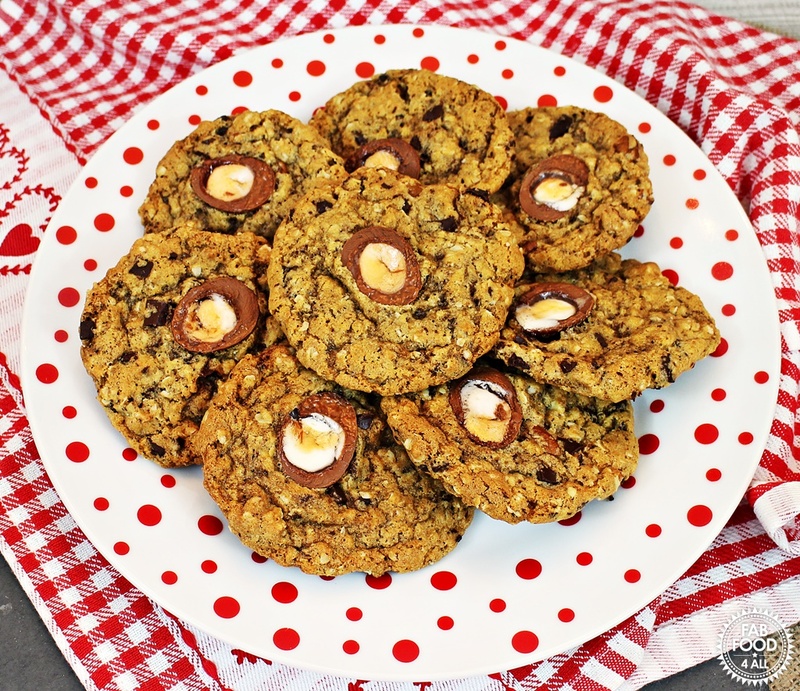 Easy Creme Egg Cookies are packed with dark chocolate, pecans and oats and topped with half a mini Creme Egg - crunchy, chewy and delicious, you'll simply love them! Line 2 - 3 large baking sheets with baking paper. Place all the dry ingredients into a large bowl and mix well. Then add the beaten egg, melted butter and vanilla extract and mix with a wooden spoon to form a dough. Form large walnut sized pieces of dough (either with your hands or use 2 tea spoons), place on baking tray 5 cm apart and top with half a mini Creme Egg, sunny side up! Place in oven and bake for 12 – 14 minutes or until golden. Allow to cool for a few minutes on the trays before transferring to a couple of cooling racks. Previous Post: « Gluten Free Chocolate Chip Pancakes – incredibly delicious! I think that is probably just about as much creme egg as I could eat. They look really good and I know the younger members of the family would love them. 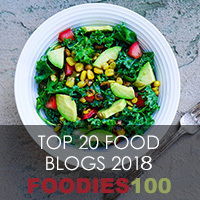 These are great – I love seeing how they spread out in the oven. I love pecans too and they’re not used enough in my opinion. 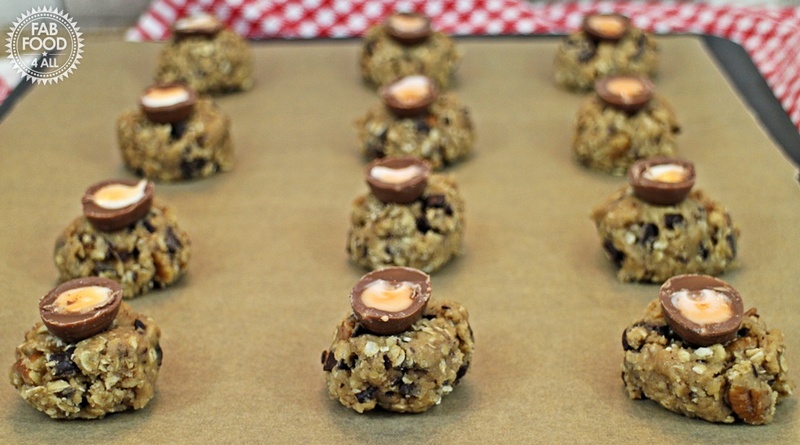 Definitely pinning to make as a great Easter treat!